Rooms at Manvers Waterfront Boat Club are ideal for water based training or small conferences, meetings and seminars away from your normal workplace. The Boat Club offers a relaxed environment located in a semi-rural location on the edge of Manvers Lake near Doncaster, Rotherham and Barnsley and is in easy reach of both the M1 and A1 with ample on-site parking. We are able to provide bespoke arrangements for our meetings in terms of layout, timings and services required. With prior notice we can also arrange audio visual equipment at additional cost. Please contact us for more information. All bookings are subject to our Room Hire Terms & Conditions. 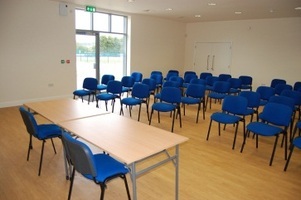 Our large meeting room is provides a light and airy venue which is suitable for a wide range of uses including meetings, seminars, training courses and functions. The room layout can be easily configured to meet your requirements - "theatre", "boardroom" and "cabaret" style layouts are all possible. The room has direct access to the outside of the building and is equipped with a projector. Our small meeting room is ideal for small, informal meetings of up to fifteen people. The room is fitted out with comfortable seating and has a wall mounted TV screen which can be used to display presentations etc. The room can also be used as a treatment room for physiotherapy, sport massage etc. (note the therapist will need to provide their own treatment table). Our cafe area is purpose designed to cope with people in wet clothing and is especially suitable for use during outdoor and water based training courses as it allows course members to alternate between indoors and outdoors sessions without having to change clothing. The room also has direct access to the outside of the building. The room is fitted out with aluminium tables and chairs which can easily be re-positioned to suit your requirements and also has a projector screen. First check the availability of our rooms using the links provided above. To make a booking please complete the online booking form listing all of your requirements - don't forget to press "Submit" once you have finished! You will then receive an email confirmation that your information has been submitted. Please note that your booking will not appear on our calendar until the booking has been checked and confirmed.